Samsung Galaxy Note II on sale from October 1st | What Hi-Fi? UK customers will be able to buy the Samsung Galaxy Note II from October 1st. 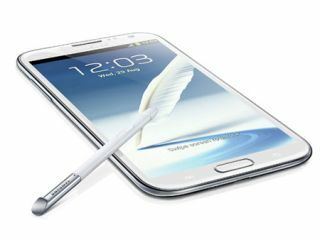 The Galaxy Note II launches with Android 4.1 Jelly Bean with TouchWiz spread over the top, and an upgraded Google Now service, which includes contextual search. It's 4G capable, and available in 16GB, 32GB and 64GB versions, with a microSD slot allowing you to expand that by up to a further 64GB. It also comes with an advanced S-Pen, a 5.5in high-definition Super AMOLED screen , 8MP camera and is thinner and lighter than its predecessor. The Samsung Galaxy Note II will be available across all major networks in marble white or titanium grey. Further details are available in our news report from the IFA Show in Berlin last month.